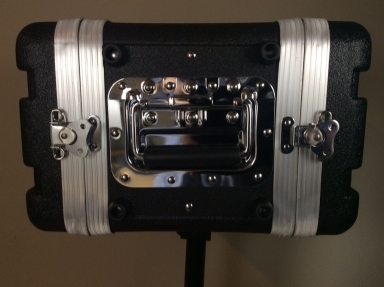 This rack cabinet is made from ABS plastic and Aluminum construction Butterfly latches on front and rear lids. Rack Mount Design with Adjustable metal shelf. 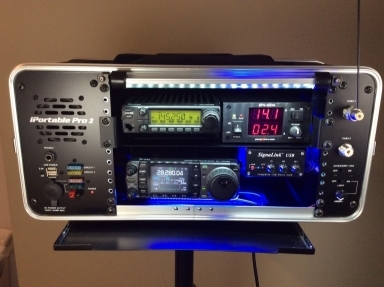 Mount any Mobile Radio , Power Supply and more. Pre-wired 12AWG to Power Radio @ 20Amps . Individually fused with automotive ATC/ATO fuses. Front firing speaker providing crisp and clear audio. Headphones 1/4" jack on front panel (mutes rack speaker). 4UD Deep Dimensions internal Depth 16.50"
4US Shallow Dimensions internal Depth 8.19"